Past Projects | Support SHU Dance on Their Journey to 2018 Nationals! The Sacred Heart University Dance Team will be traveling to the NCA/NDA Collegiate Cheer and Dance Competition for the 19th time from April 5-8, 2018 in Daytona Beach, Florida. 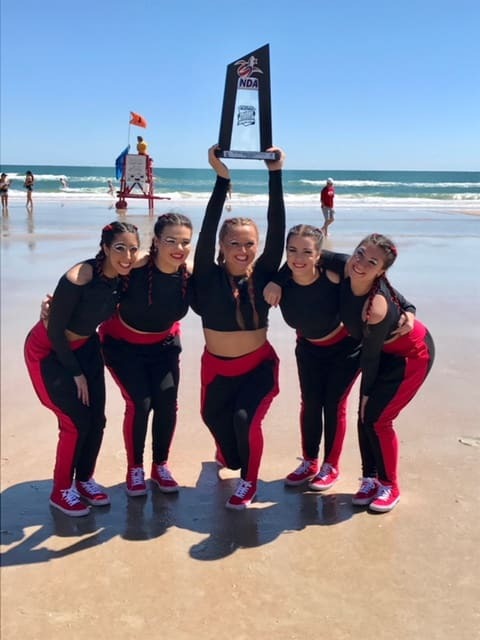 They work with nationally recognized choreographers to develop the most competitive routines and have had a consistent presence in Daytona Beach, placing 3rd at last year's NCA/NDA Collegiate Cheer and Dance Competition! This trip is a substantial financial undertaking and much of the cost paid for by the SHU dancers themselves. We hope that alumni, family, and friends will consider supporting the SHU Dance Team and help alleviate some of the financial obligation from the dancers. The NCA/NDA Collegiate Cheer and Dance Competition is the largest and oldest collegiate dance competition in the country with over 6,000 college students in attendance. Founded in 1994, the SHU Dance Team catapulted itself onto the nationals stage as the smallest Division 1 school in the competition having had multiple top 10 rankings in the team performance category and the hip hop category, as well. SHU Dance Team will compete in the Division 1 team performance, which is the most rigorous category incorporating jazz, pom, and hip hop styles into one, 2 minute and 15 second routine. They will also compete in the highly competitive Division 1 hip hop category, fitting the latest styles and tricks into a 2 minute routine. The goal is to make it out of the preliminary competition and onto the great finals stage: The Bandshell. The Bandshell is an outdoor stage built onto the sands of Daytona Beach where thousands of spectators attend. In addition, the event at The Bandshell will be broadcasted on CBS Sports Network! The Sacred Heart University Dance Team is a Club Sport that strives for excellence in all we do. We perform at all home football and men's and women's basketball games as well as compete on the national and local level. The team, founded in 1994, consists of women with varying backgrounds and trainings from ballet, to hip hop, to gymnastics, to jazz, and all others in between. We pride ourselves on learning from each other and incorporating unity among all team members. Each dancer is an integral part of our team and has the opportunity to showcase their talents through choreography, which then may be taught to the team and performed. A crowd favorite, SHU Dance is often asked to perform at campus events such as open houses, spring weekend and other local or community events. Go Pioneers! Your gift of $25 will help support the airline baggage fee for one bag of competition gear. Your gift of $100 will help support the purchase of one hip hop costume for a SHU Dancer. Your gift of $330 will help support the purchase of one round trip airfare for a SHU Dancer. Your gift of $500 will help support the ground transportation from SHU to the airport and back. Your gift of $1,000 will help support the entire trip for one SHU Dancer.